It's amazing how many Christians and pastors both use the excuse "that is not what I am called to do" when you try to talk to them about pertinent issues facing our country and how we as Christians need to get involved. That is because our modern churches are filled with subtle, pacifistic, and effeminate teachings that have sidelined an entire generation of believers. While most people quickly get bored when talking doctrine and theology I cannot stress enough how important it is to take these teaching head on and demonstrate how they are grossly responsible for the degeneration of our Christian culture and thus the culture at large. The Devil simply loves twisting scripture. In doing so he is able to build entire doctrines that almost always remarkably give Christians convenient excuses as to why they don't have to get involved with the freedom fight and culture war raging all around us. The importance of getting Christians to wake up to these false doctrines is why ever so often I will be using this column to re-examine modern teachings and point out their devilish flaws. If you have missed my previous columns on doctrinal issues you can check out a few that I have linked up at my site WaketheChurch.org. The column will go out every Tuesday around 9am MST and I encourage you to sign-up for the newsletter to stay current and share each important topic I will be addressing to friends and pastors. Spiritual Gifts or Spiritual Excuse? If you have been around the modern church for any length of time you have almost certainly come across a teaching or study on Spiritual Gifts. You will hear pastors and parishioners alike tell you how you as a Christian need to determine your unique spiritual gift if you wish to better serve the Kingdom. Usually they will encourage you to go to a study in which the teacher will present the topic of spiritual gifts to a group of people so you will have a better understanding where your ministry calling may be. Usually the presenter will talk you through a few verses in either Ephesians 4:11 or in 1 Corinthians 12:27-31. After discussing the concept of spiritual gifts the presenter will pass out a questionnaire, workbook, quiz or test of some kind that you are expected to honestly fill out. After filling out the quiz you add up the total and it tells you where your gifting is. Now to be clear I don't have anything against the teachings on the passages outlined by Paul on spiritual gifts, obviously spiritual gifts are Biblical and play an important role in the life of a believer. Where I take issue is how they are over emphasized to the point of overriding universal commands by Christ and the apostles. I don't care if you think of yourself as a teacher, or an administrator, or if you have the gift of edification etc just because you took the "test" and that is what it said. At no point should that be an excuse to not involve yourself with the culture war we face here in America. It is a travesty how many Christians use their "gifting" as an excuse to not get involved and it has resulted in people simply passing the buck on their responsibilities as Christians. Pastors say they don't have to preach politics because they are only gifted as an evangelist and will only preach the Gospel, Administrators won't preach the Gospel because they aren't evangelists, or a teacher won't help organize rallies or public events because they aren't prophets. Around and around it goes.Nobody wants to take action in their communities, nobody wants to address the lies Satan is piling into our schools, nobody wants to stand up against wicked politicians and corporations who are destroying our families and economies with endless war. Why? Because it goes back to this gifting thing. You will hear people say that addressing the culture war is outside their "special" calling and those who are called as prophets should be doing those things just not them. Problem is that nobody is doing them. When we think of Jesus Christ we think of God in human form. This means that Jesus, as God, perfectly embodied and demonstrated all of the spiritual gifts laid out by Paul in the above scriptures. He demonstrated the gift of teaching to the masses of crowds that would gather to hear him speak. He was miraculously healing the infirm everywhere he went. In the spirit of administration he diligently lead and delegated tasks among his disciples from finances, to crowd control, meal prep and even defense. He was constantly encouraging and sometimes chastising his disciples in the spirit of edification. He even railed against the civil and spiritual authority of the Pharisees condemning them for their legalism and arrogant ways in the powerful spirit of prophecy. And they as civil authorities tried arresting him, and stoning him for it, something only civil authorities can do. The excuse that they were only spiritual leaders doesn't hold water here, the Pharisees had the power to arrest and even execute people through capital punishment as co-rulers there in Jerusalem. Those are things only civilian authority can do. It is without question that Jesus as God didn't just teach to the disenfranchised, he also exercised his power and authority in the prophetic and political realm by walking right into the heart of opposition in the temple in Jerusalem. The Bible tells us that the Holy Spirit is working to conform each Christian to the image of Christ. If this be the case then we should not only work towards all the ministration giftings, but also be looking to use the gifting in the prophetic range as Christ demonstrated and so did the Apostles in like fashion. The trick is we must begin to see that the Holy Spirit seeks to guide us outside of our comfort zones and into the fullness of other gifts. When Jesus called us to be "Salt and Light" (Matt. 5:13-16) he meant to engage the culture, not make excuses why we aren't gifted to do so. When Jesus told his disciples to "preach the Gospel to every creature" (Luke 24:46-47) he meant everyone preach the gospel. When Jesus condemned the Pharisees for their profiteering(Luke 19:46) he expects you to condemn Christian hypocrites, not follow them and give them your money like these televangelist pimps. Every single one of these commands will take a Christian outside of his or her confront zone. Jesus did not set exceptions on these commands expecting just the prophets, or the teachers or the preachers to do the hard dirty work of exposing evil. He expected everyone to take up the same cross he took up, put themselves out there day in and day out. Whether you felt gifted, lead or called to do so matters not, a command is a command. There are simply universal commands that God gave us that reach into every area of Christian life that every Christian must take responsibility for. This picking and choosing what you want to do is the biggest cop-out and won't be tolerated at the final judgment. The time is now to pick up the plow and work the field hard until harvest, not after the fact. 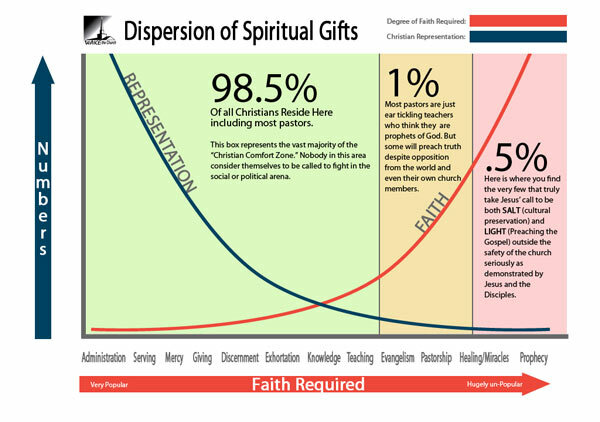 I have divided the gifts up in a chart, I call this the "Dispersion of Spiritual Gifts Chart" click link for the full chart. This is an estimate of course, but anyone that finds themselves in a church will rightly agree that this is a fairly accurate representation of how the vast majority of Christians seemingly always find themselves in the green zone, never pushing into the right side columns. Gifts that demand a ton of faith, are way outside of everybody's comfort zone, and encroach on peoples threshold for truth, making the messenger hugely unpopular with their audience. The old testament prophets didn't like doing what they did, but they knew they had to do it. Not to testify against the wickedness meant the destruction of their beloved nation often times. When we look at Christ's ministry we don't see him spending 98% of the time teaching to the poor and sinners, and 2% engaging the Pharisees, no it is more likely the percentage was about 50-50. Meaning 50% of the time he was engaged in debates or condemning the establishment and 50% preaching to the poor. And if Christ be our perfect example then know that you will be accountable for your action and inaction along those same lines. If you don't believe that it is this much go through your Bible and underline how many times Jesus came in contact with the Pharisees in which he admonished, prophesized against and even physically beat them. It is significant to say the least, meaning it was hugely important to God to be in direct confrontation with these civil and spiritual hypocrites. The apostles in like manner having witnessed his example had no problem obeying God in direct rebellion with the civil authorities. The Bible is full of passages demonstrating how God's chosen people always stood up to evil, wicked government and doing so was almost always outside of their comfort zone. This demonstrates that the Holy Spirit is not there to make you feel comfortable and non-confrontational in your "special gift." No the Holy Spirit pushes us into all the giftings as our faith grows in Christ. We are working to conform ourselves to Christ's image not pigeon-hole ourselves into what we want to do in our own power and our own strength. No, God wants us to be so far outside of our comfort zone we have to rely on him in total faith. It is then and only then the Spirit of God takes over so that we might glorify His strength in the presence of our obvious weakness. Acting in faith is a catalyst of the Holy Spirit. God has proportioned all things, and none of those things are the same in every man or woman. Our physical strength, our intellect, our family, our talent, and resources are all of these things he gives in measures. No matter what the liberals say nothing in nature is equal, everything is either privileged or under privileged and that is how God made it, including the amount of faith he has given us. But a principle you can count on is if you exercise you will increase your strength, if you study you will increase your intellect, or if you work hard you will rise above your circumstances. This also is true in growing one's faith, exercise it and it will grow. I encourage every reader of this column to not get complacent in their so called "gifting" but to rise to the challenge daily, put themselves out there, exercise their giftings in other areas especially the gifting in the prophetic/truth-telling arena. It is those giftings that require tremendous faith but are there to preserve our culture as we engage in a courageous way. Weeding out the wicked in government, in our churches, in our school systems is what we as Christians have to do if we want our children to grow up in a God-fearing culture that loves morality instead of the immorality we see now. In closing let's look at those last chapters in 1 Corinthians 12, Paul asks a rhetorical question regarding the Church body there in Corinth. Paul say's the only thing we are to covet as Christians are the BEST SPIRITUAL GIFTS, meaning that of Apostleship, Prophecy and Teachers as ranked in verse 12:28. Covet them Christian, work towards them Christian, get yourself outside of the safety of the church and engage in a public way. The church is a bushel that covers your light, you need to be doing so much more than attending church and endless Bible studies your entire life. That doesn't take an ounce of faith, what takes faith is putting yourself out there. If we don't do it now then the salt has lost it's saltiness and is good for nothing.Jesus metaphorically said in Matthew 5:13, we might as well as toss this culture(salt) out the window and let it be ground up because there is no preserving rotten meat once it has gone bad. That is where we are today, we are truly at the crossroads of losing our culture. Let's show God that we will obey the prompting of His Holy Spirit on our lives to engage, let's take this fight to the enemy at every point and let's not let up even if it costs us our freedom through incarceration or our lives as in the example of Christ himself.